We are each born with a unique combination of heavenly and earthly energies defined by the Five Elements and dictated by the Universe at the moment you take your first breath. This “birth chi” can be calculated using the year, month, day, and time of your birth, and it reveals your personal profile of health and emotional strengths and weaknesses as well as the energy cycles you will encounter throughout your life. In this Inner Alchemy Astrology nutrition guide, Master Mantak Chia and Christine Harkness-Giles explore how to strengthen your birth chi through your eating habits, revealing which foods will address imbalances in your Five Element organ energy profile. 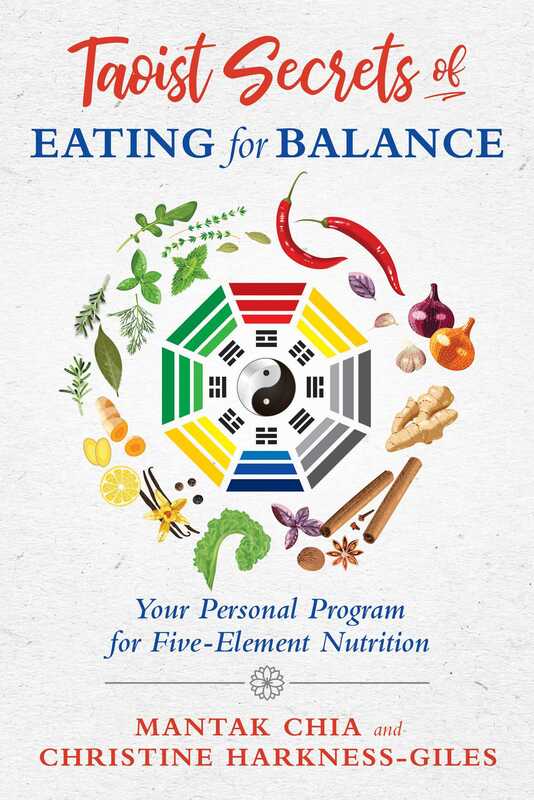 The authors explain which organs are connected with each Element--Wood, Fire, Earth, Metal, and Water--and provide detailed food lists based on ancient Taoist wisdom that reveal the Yin, Yang, hot, cold, and Five Element aspects of many common foods and superfoods. They emphasize the importance of local, seasonal, and fresh foods and of acid-alkaline balance for health. The authors illustrate the Five Elements’ characteristics through sample profiles for celebrities such as Paul McCartney and Meryl Streep, along with Taoist nutritional recommendations based on their charts. The authors also explore how your Inner Alchemy astrology profile determines your life and relationships and explain how inner alchemy practices and Five Element nutrition can improve all aspects of your life. By eating in line with your personal Five Element energetic profile, as part of ancient Inner Alchemy techniques, you can improve health and longevity and strengthen connections with your loved ones and the energies of the cosmos. Your Inner Alchemy Astrological birth chart can tell you so much about yourself and also tell you how best to treat yourself in life, and this book will be looking at extremely important aspects of treating yourself well. Chinese Astrology or Taoist Astrology, if interpreted according to the Five Element concept, will show the weakness and strengths of the organs determined at birth. This base is with you for the rest of your life and if it is not consulted or corrected, the present life of the person cannot always be improved successfully. The Tao says that you should treat your organs like children and make sure that they are all happy. This involves satisfying them with the five colors, five smells, and five tastes. The practice of Five Element Nutrition relates Taoist food theories to your own astrological profile. Ancient Taoist texts describe foods as being “hot for the liver” or “cooling for the kidneys” or “too yin for the heart,” and in this way foodstuffs and aliments’ energy have been defined for 5,000 years. We can translate this by saying that warming or heating for an organ is “yang” and cooling is “yin.” There is also “neutral” which means that it is neither. Today we talk about pH or acid-alkaline balance, which again was not a concept that ancient Taoists could measure, but they understood and strived for a yin/yang balance. Emotions effect digestion directly. As the ancient Chinese Taoists said, having anger and jealousy is like “drinking vinegar.” Indeed these negative wood emotions upset the balance of the wood organs, the liver and gall bladder, affecting the production and release of bile and digestive enzymes. These secretions will become more acid and we are quite likely to have a sour, acid taste in the mouth and stomach. Further, this upset in acid-alkaline balance will impede proper digestion. Comparing the Western diet with Taoist and/or Asian diets and their effect on the individual, Master Chia realized that it is important to look at the Five Element energies the person was born with, as well as their present life and body, to understand and affect a food cure for their conditions. He also incorporated Western ways of looking at what a body could lack nutritionally compared with the person’s Five Element profile and particular needs to balance the elements. Integrating these practices together, he developed the practice of Five Element Nutrition. Having looked at the fundamental Taoist principals of nutrition, in the next chapters we will introduce the food lists, which have been complied over 30 years of Master Chia’s development of 5 element nutrition. They show how foods can increase or decrease Fire, Earth, Metal, Water and Wood Chi. This information has then been organized into lists including lists for all the major organs. The idea is to use the food lists as part of the treatment for organ energy. Therefore we can treat the organ by going to the list for that organ and looking at the way that foods affect the Chi of this organ. Similarly, you can also review the Five Element food lists to find foods that enhance a particular Element. 1. Cinnamon regulates blood increasing glucose metabolism, anti-oxidants, anti-microbial, reduces ‘bad’ cholesterol & triglycerides and regulates blood pressure. 2. Garlic lowers ‘bad’ cholesterol, triglycerides and blood pressure, has anti-coagulants, anti-viral, anti-parasitic, and anti-microbial as well as plaque dissolving properties. Garlic also plays a role in cancer and common colds prevention. 3. Ginger has its own anti-oxidants, gingerols and gingerdiones as well as anti-inflammatory, anti-cancer and cholesterol lowering properties. Ginger has anti-viral, anti-microbial, immune boosting, blood thinning and circulation improving characteristics, as well as anti-nausea effects. Its anti-nausea properties are particularly interesting for pregnant women as it is effective and safe for the pregnancy. It is good for indigestion and blood coagulation as it counteracts damp, promotes Chi circulation and drains water. 4. Onions are known for easing conditions such as high blood pressure, indigestion, urine and phlegm problems; lowering bad cholesterol levels and healing wounds, urinary and vaginal infections. 5. Mint is inclusive in so many products from toothpaste, sauces, chewing gum, etc. confirms that it has always had superstar status and ancient wisdom has always known its qualities of decongesting the respiratory system, relieving headaches, indigestion, hay fever, fatigue and depression. It helps in prevention of cancer and allergies and tonifies the memory, refreshing and helps oral hygiene. It can prevent homeopathic remedies from working though, so avoid mint in toothpaste when taking them. 6. Radish (the star of the radish family is horseradish) counteracts damp, promotes Chi circulation and drains water. It reduces internal heat, inflammation and toxins in the body, is good for moving mucous in the case or coughs and sinus infections. It can also help reduce tumors. 1. Seaweeds are the richest plants on our planet in terms of nutrients, minerals and trace elements. They have been harvested and eaten fresh, or preserved generally by drying, since mankind started to harvest food. Their detox properties protect us from the poisons which our planet polluters pour into the sea and which then make their way into the food chain. They have properties of fucoidan which prevents cancer, and vitamins levels of which vary according to the variety and source of seaweed. Their properties improve kidney energy and can prevent goiter and other thyroid issues, some cancers, notably leukaemia and also glaucoma. It reduces internal body heat, high blood pressure and disperses congestion, helping coughs and dispersing fat concentrations in the body. 2. Oily Fish such as mackerel, anchovies, sardines and wild salmon are rich in omega 3, a fat which is essential to make connections in the brain. They are considered good for memory, skin and the immune system. Christine Harkness-Giles is a certified Universal Healing Tao instructor, feng shui consultant, and astrologer. She teaches and consults in feng shui as part of the Feng Shui Research Centre network and leads Inner Alchemy Astrology classes in London, Brussels, Paris, and Hawaii.